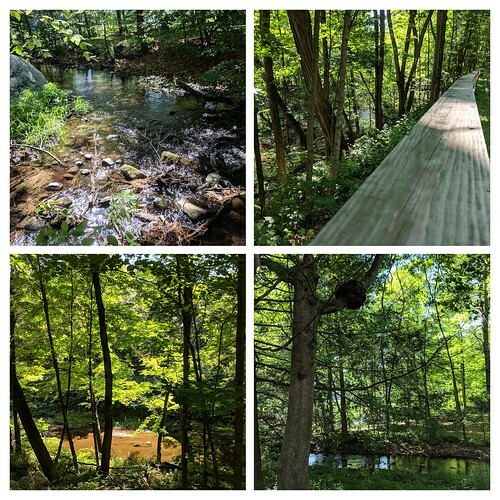 Since yesterday was the World Listening Day and another day in Write Out, I decided to head into the woods to a local protected greenway space to listen to nature. First, I captured my walk in sound and video. And then, I stopped in another spot and composed a poem on the fly (no paper) as I put my audio recorder app right near the bubbling stream, so that the water became both the inspiration and the soundtrack. A friendly email arrived, with a request. Might I be willing to write a poem? Oh, and there was a fast turn-around deadline. 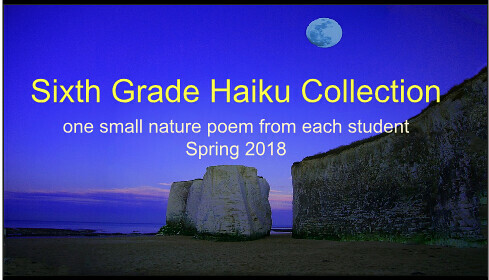 I’d have to get the poem out the door within just a few days. The theme of the project was Entropy, and so as I put on headphones and listened to the tracks that Luka provided (interesting stuff, as always from him), I read up on Entropy, trying to wrap my head around the concept and how it might translate into poetry, and music. Then, I wrote … just letting the words flow as I listened to the beats and musical landscape of the tracks. It was one of those times when I only thought about what I was writing later, in revision. First, I let the music guide me into discovering the possibilities of a poem. Fast forward a few months, and I saw Luka promoting the CD, with a limited series artistic cover available, so I ordered it, and the resulting project (airmailed from Luka from Slovenia, with a very kind note from him) is just beautiful. 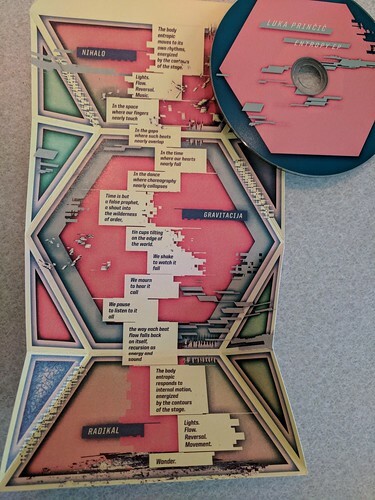 My poem is splayed out in the center, but the way the cover folds in and around itself, and the use of art to explore music (and vice versa), and … well … the whole dang thing is just pretty cool to have in my hands. I am always drawn in by my friend, Simon, and his blog posts. They are rich with imagery, and emotion, and wondering, and although sometimes I have trouble following where he is going (and yet, I seem to find myself right where he led me), I keep going forward. I float in his language. This morning, he shared a poem at his blog and as I read it, I saw another poem emerging from beneath his poetry. It seemed like I just needed to create a digital poem for him, if only to reflect his words back to him as a reader honors the poet. PS — this was made in Lumen5. Terry left a few comments in the margins of my post, about writing about the margins of an article about Digital Writing. His phrasing caught my attention. 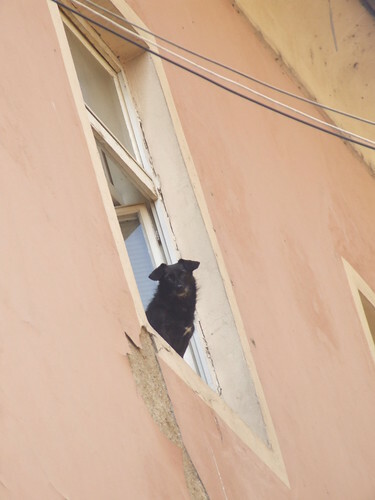 As we often talk about extending notes and comments beyond the original source, I took a few of his words (of dogs and poets) and riffed a poem off the top of it. And then I shared it in Mastodon, where I often write #smallpoems with CLMOOC friends Terry, Algot and others. So, from here to there, and there, to here, and then there again. I wasn’t sure if other people would follow me up on my invitation. 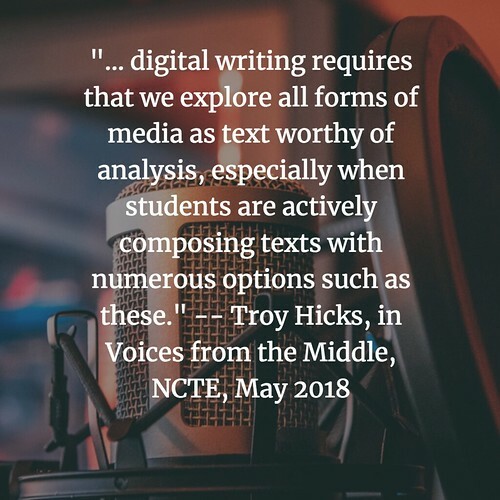 But I knew I wanted to annotate with Hypothesis the opening article in the NCTE journal — Voices from the Middle — about the future of digital writing, by Troy Hicks. Then, I saw a tweet from a friend, Gail, commenting on the article, too, and I knew I had to go ahead and start up a crowd annotation project. I wasn’t the only one wanting to engage with the text. So, I sent the link out a few times over the weekend, and got some folks to engage with me (including Troy, and I can’t say enough how important it is to a reader to the have writer engaged in the margins in a conversation about the text they wrote.) By midweek, there were nearly 40 annotations — a mix of words, image, sound and video. You see, this was not just about reading about Digital Writing. It was also an act of using Digital Writing to make sense of the piece about Digital Writing. Sure, a bit recursive, but an important insight. We can talk and write in text all we want about what writing should be. But when the opportunity comes to write with media, to write in the margins of an online text, you need to take the invitation forward. So, here I am, aiming to pull out some of the many threads from the conversation in the margins in a way that helps me make sense of it all, and maybe gain some reflective insights. If you do the same, please share your link. We can then be linked together. It’s not just the defining of the term, but also whether we even should be using Digital Writing as a signifier. Or it is just … writing, with the digital element just part of how we write. Or, maybe, composition? The technology itself is less important than helping to nurture student agency on how to best use the technology available at this moment in time to find clarity of thought and intent, and creativity. Joe riffs off Troy’s mention of Snapchat, to show how this social sharing tool has possibilities for sharing stories, not just gossip. Some of us used the margins as a place to leave poems, inspired by the text. Thanks to Greg, for example, for his small piece. To use poetry to express understanding, or to ask questions, or to further the topic … this is another way the margins can become active and alive in interesting ways. It’s writing about the writing, attached directly to the text. Mulling over what forms of media enhance writing, and which might distract, is part of what writers do, and Sheri notes, in a comment about Word Clouds, how she remembered a student using this visual representation of text, and then going much deeper with a reflection on design, colors, fonts and more. This pushing deeper into understanding through reflective practice is important. 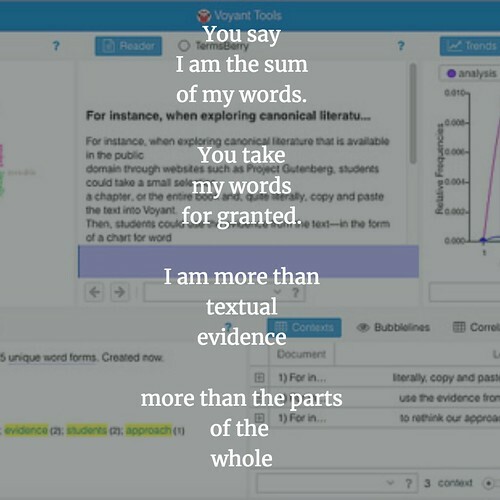 The ability for us, as teachers, to expand access and opportunity, and choice, with digital tools for writing and expression remains a challenge for many of us, hemmed in by our current school structure (and funding woes). Terry makes a connection to both Ivan Illich (whose work on DeSchooling was recently annotated in CLMOOC — see that work here and note how one annotated text now connects to another annotated text) and sheep farming, as Terry mentions a certain stasis that many of us find ourselves in. He suggests that words in the margins are not enough. Action and change is required, if we are to reach all our students in meaningful ways. Greg makes note that the web and the ways we interact with it with our writing has changed, moving steadily away from “the open web” to a more corporate structure. He suggests, and he is working hard, to move us back to the Indieweb concept, including finding ways to give ownership of spaces to students to find their voice and their passion. Troy shares various links to various sites and applications and platforms where one might explore further some of the potentials extensions of writing. I re-found Voyant through Troy’s piece. It is a writing analysis tool that has many bells and whistles as it creates a snapshot analysis of writing. Here, I took a paragraph from Troy’s piece and put it through Voyant. What does one do with this? I suspect one would dig in and then find ways to remix the analysis, to surface and uncover things below the writing itself. And finally, Troy, in being part of this discussion about his own text, notes his appreciation for this kind of discourse. What this does is keep the text alive and out in the open. Which, I contend, is important for any consideration of the future of writing. The beauty of Hypothesis is that the annotation doesn’t have to end now. It can restart anytime you arrive and make a comment. So, whether today is today (my time) or a year from now (your time), please do come in and add some thoughts. Reflect. Connect. Write about writing.